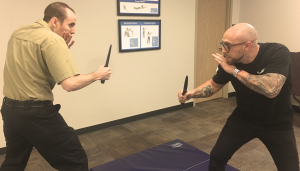 Point Blank Range presents an exclusive training opportunity with the new Edged Weapons Seminar taught by Steve R. with Foo Dogs Defensive Tactics. In this three-hour seminar we will go through techniques on how to defend yourself against an attacker or multiple attackers using edged weapons or improvised weapons regardless of size, strength, age, or gender. Students will gain confidence and build a sense of empowerment with the development of a new skillset which expands your means to defend yourself outside of use of firearms. Steve has over 30 years of experience in Martial Arts and 16 plus years of experience in Israeli Close Quarter Concepts such as Haganah, Krav Maga, Kapap, and he has trained countless Military and Law Enforcement personnel. Training knives provided for use during this course or purchase your own. Fox DART American Tanto knives, the fastest deployment knives on the defensive market, have been ordered!! If you purchase your own DART knife from Point Blank Range, you will have an additional exclusive opportunity to train WITH STEVE for an additional hour after the seminar and learn techniques specific to this knife. This benefit is offered at only $49! Make sure to pre-order your Fox DART Tanto knife today!